Those who pre-ordered the game for Essen Spiel 07 received 2 bonus flight cards, which add even more variety to the game. Leave the bonus cards out of your first game. There is no sense in making the first game too complicated, and you can look forward to using them. The first time you decide to include the bonus cards, we recommend adding them to the Round 3 flight cards. This will give you 18 instead of 16, but you can be certain that they will turn up. This will make Round 3 a bit longer and more intense. In later games, put them into decks II and III. That means they might show up or they might not, just like any other card. Tip: Don’t want to turn all those unused components face down just so you can choose 5 at random? Have one player close his or her eyes and blindly choose 5 after another player has mixed the components up. It’s nice to be able to pick up spare parts when you are trucking across the galaxy. Unfortunately, Star Depots are rare: Corporation Incorporated stopped building them once they learned that fines for undelivered components account for 63% of revenue. You can use the Star Depot to add a new component to your ship or to replace one component. If replacing a component, set the old component aside. Don’t put it in your discard pile. Don’t set it out among the other Star Depot components. Your new component must be added according to the standard rules for building. You only get new battery tokens or crew members on the new component that you got from the depot. In a new cabin, you can put either two humans or one alien (if the cabin is joined to the appropriate life support module and if you do not currently have an alien of that color) but adding a new life support module does not allow you to change crew members in adjacent cabins. Everyone who takes a compnent from the depot moves back 1 flight day (starting with the last player, just as you do with Planets). Tip: It’s probably good strategy to pick on someone who is doing better than you are, but it might be more fun to send meteors at the player whose ship is in danger of breaking into two pieces. Sometimes it takes more than just another cup of coffee to keep galaxy truckers awake. That’s when they head into a planetary ring for a game of Space Billiards. Try to send meteors at your buddies without getting your own ship crushed. It’s guaranteed to keep your eyes open. The lead player chooses a row and an opponent. The opponent defends against those meteors according to the Meteor Swarm rules — except that the player who chose the row rolls the dice. Then the second player chooses one of the remaining rows, and so on, until every player has chosen one row. Use your markers to indicate which rows have already been chosen. There is no restriction on which opponent you can target. One player may have to defend against multiple rows of meteors. 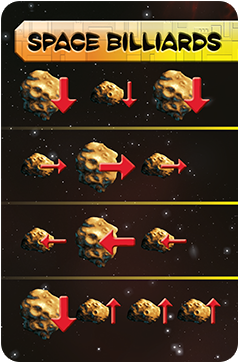 In the brutal version, each player chooses a row and those meteorites fly at every other player’s ship.